Graduate General Nurse, Certificate of Intensive Care Nursing. Graduate Obstetrics Nursing, D.Univ (honoris causa) (ACU). Registered nurse at various hospitals including St Vincent’s Public and Private Hospitals in Melbourne. Currently legal executive at Ashurst. Trustee of The Scobie and Claire Mackinnon Trust. Secretary of Melbourne Refugee Sanctuary Group Inc.
Paul Harris Fellow Rotary International. 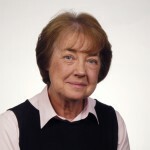 Margaret Gurry’s work has been recognized and honoured with two awards, namely Member of the Order of Australia on 14 June 2004 and later an Honorary Doctorate from the Australian Catholic University. For service to migrant children and their families through the establishment of the Friday Night School to provide assistance with school work and English language tuition.